New nominees: Movie critics awards have been making headlines all month, but last week brought new nominees from two high profile groups that are better bellwethers for how Academy members may mark their nominating ballots. The Screen Actors Guild (SAG) announced its 22nd annual SAG Awards nominations Wednesday and the Hollywood Foreign Press Association (HFPA) revealed its 73rd annual Golden Globes noms Thursday. While there were many differences between what the two groups celebrated, thosewho turned up on both lists will benefit the most going forward. Between the two groups, it's SAG that's really the better indicator of how the Oscar noms may go because many SAG members are also voting members of the Academy. In fact, the actors' branch is the Academy's largest voting block with about 1,150 members. In contrast, none of the HFPA's membership of some 90 journalists reporting on Hollywood for obscure publications around the worldget to vote for the Oscars. The Globes, however, is a high profile media event that draws huge ratings for its red carpet coverage and awards ceremonies every January. Last year, for instance, about 19.3 million viewers tuned in to NBC to watch the Globes while the SAG Awards telecast on the cable networks TNT and TBS attracted around 5 million viewers. The SAG noms influence Oscar noms because of the two groups' overlapping memberships. The Globes noms influence Oscar noms because Academy members tend to see the Globes noms as a way of determining which movies to take time to see before they make nominations. Oscar nominations voting begins Dec. 30 at 8:00 a.m./PDT and the voting ends Jan. 8, 2016 at 5:00 p.m./PDT. That's too short a window for Academy members to see all the movies up for consideration. Voters wind up getting 60 or more DVD screeners for potential contenders and they simply can't or won't make time to watch them all. Compounding the problem is the fact that so many Academy members go away for holiday vacations, giving them even less time in which to see movies. In sharp contrast, all the Globes see films throughout the year as part of their journalistic work and they also attend press conferences with stars and filmmakers. As a result, the Globes noms are a good cheat sheet for Oscar voters to use when they have to decide what films they should be sure to consider. The Globes' awards structure, however, is very different from the Academy's and that accounts for big differences that often are seen between the two events. The key difference is that the Globes nominates five best picture dramas and five best picture comedies or musicals. The Academy nominates up to 10 best pictures of all types, but is well known for not giving serious attention to comedies. That said, SAG and Globes noms are a very valuable marketing tool for Hollywood -- not just for Oscar campaigning, but also for selling tickets -- especially during the holiday season when moviegoing expands. Being able to boast about multiple noms for a film or its stars is a great marketing tool and the studios make the most of it. Last year, SAG voted its best ensemble cast award to "Birdman," which went on to win the best picture Oscar race. The Globes vote for best picture-drama, however, went to "Boyhood." Here's a look at who did well on the best picture front in last week's first round of SAG and Globes awards action. (1) The nomination for Netflix, Bleecker Street Media and Participant Media's R rated war drama "Beasts of No Nation" is particularly significant since it's an original production by the digital streaming service Netflix rather than a traditional studio release. Hollywood handicappers have been buzzing about "Beasts" since it was embraced after playing as a special presentation at the Toronto International Film Festival last September. Previously, it had played very well at festivals in Venice and Telluride. Netflix's decision to open "Beasts" as a streaming day-and-date release on Netflixand in theatres was a radical departure from the usual release pattern that movies follow with 90 days separating their theatrical and video-on-demand release. That resulted in the four largest domestic theatre circuits deciding not to play "Beasts," which didn't help it one bit at the boxoffice. Netflix hasn't released any details about how well the film did with streaming audiences, but insiders believe it was a big hit in the digital arena. (2) Paramount, Plan B Entertainment and Regency Enterprises' dramatic comedy"The Big Short" is directed by Adam McKay ("Anchorman 2: The Legend Continues"). It's based on a book by Michael Lewis, whose books "Moneyball" and "The Blind Side" both became best picture Oscar nominees. Starring are: Christian Bale, a best supporting actor Oscar winner for "The Fighter," Steve Carell, a best actor Oscar nominee for "Foxcatcher," Ryan Gosling, a best actor Oscar nominee for "Half Nelson" and Brad Pitt, an Oscar winning producer of "12 Years a Slave." In the Globes noms, "Short" qualified as a comedy, a category in which there is typically less strong competition than in the best drama race. For Oscar consideration, being perceived as a comedy can be detrimental because Academy members don't usually reward comedies with a best picture win. SAG also nominated Bale in its best male supporting actor category. "Short" opened in limited release last weekend to seriously strong business at eight theatres with $720,000, an enviable $90,000 per theatre. It expands its run Dec. 18 and goes wide Dec. 23. (3) Open Road Films, Participant Media and First Look's R rated dramatic thriller "Spotlight" is co-written and directed by Tom McCarthy, director of "The Station Agent" and an original screenplay Oscar nominee for "Up." Starring are: Oscar nominees Mark Ruffalo, Michael Keaton and Stanley Tucci; and Rachel McAdams, Liev Schreiber and John Slattery. "Spotlight" is another good example of why Hollywood cultivates film festival audiences in the early fall. The film was embraced by audiences in Venice, Telluride and Toronto and, predictably, an Oscar buzz resulted immediately. SAG also nominated McAdams in its best female supporting actor category. "Spotlight" ranked ninth at the boxoffice last weekend with $2.5 million at 1,089 theatres. Its cume after six weeks is $20.3 million. (4) Universal and Legendary Pictures' R rated music biographical drama "Straight Outta Compton"is directed by F. Gary Gray ("Law Abiding Citizen") and stars Dr. Dre, Easy-E, Ice Cube, MC Wren and DJ Yella. "Compton" is a strong urban appeal drama setin 1987 in Los Angeles' notoriously dangerous Compton district. Its SAG nom definitely puts it on Academy members' best picture radar. Hollywood handicappers anticipate that it will get strong consideration, especially since the Academy was widely criticized last year for a lack of diversity in its nominations. "Compton" opened last Aug. 14 to $60.2 million and went on to gross $161.2 million domestically. SAG did not nominate any of "Compton's" ensemble cast members in any of the guild's individual acting races. (5) "Trumbo," the R rated biographical drama from Bleecker Street Media and Groundswell Productions, is directed by four time Primetime Emmy Award winner Jay Roach. Starring are: Bryan Cranston, a Golden Globe winner for "Breaking Bad,"Diane Lane, a best actress Oscar nominee for "Unfaithful"and Helen Mirren, a best actress Oscar winner for "The Queen." "Trumbo" has a big advantage with all Hollywood awards givers in that it'sbased on the true story of Hollywood screenwriter Dalton Trumbo, whose highly successful career ended abruptly with his blacklisting in the late 1940s for being a Communist. The Black List period is something that many of the Academy's oldest members lived through and, in some cases, suffered through, themselves. There could be strong sympathies among the voters for Trumbo's real-life demise. SAG also nominated Cranston in its best male actor category and Mirren in its best supporting female actor race, a strong indication of the guild's support for the picture. 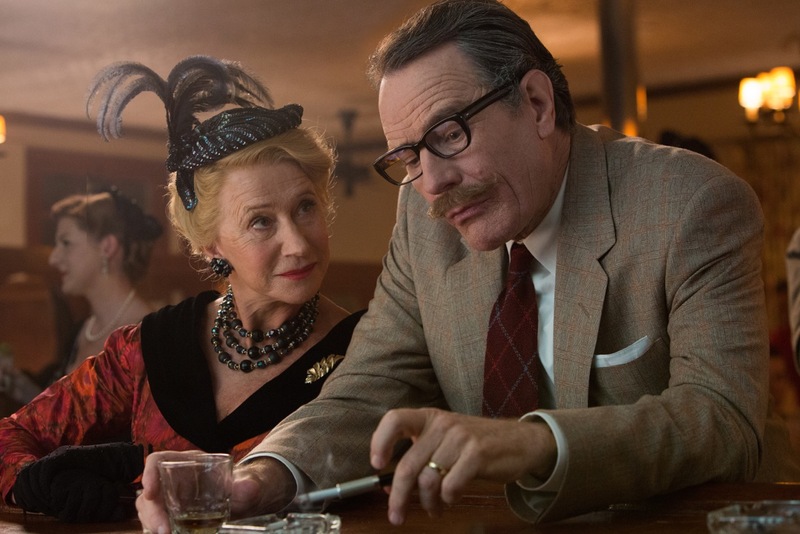 "Trumbo" grossed $810,874 last weekend at 554 theatres, bringing its cume to $5.5 million after six weeks. (1) The romantic drama "Carol" from The Weinstein Company, Film 4 and Killer Films is directed by Todd Haynes, an original screenplay Oscar nominee for his film "Far From Heaven," which received four Oscar nominations in 2003. Starring are: Cate Blanchett, a best actress Oscar winner for "Blue Jasmine" and a supporting actress Oscar winner for "The Aviator" and Rooney Mara, a best actress Oscar nominee for "The Girl With the Dragon Tattoo" and an award winner for "Carol" at the 2015 Cannes Film Festival. Both Blanchett and Mara also received Globes noms for best actress in a drama, which is likely to work against each of them since it will split the vote by SAG members. If, however, the Academy follows Weinstein's lead and puts Mara into the supporting actress category, that would dramatically increase her prospects as well as Blanchett's prospects in the lead actress race. "Carol" had a total of five Globes nods, the most for any film this year, also including directing (Haynes) and original score (Carter Burwell). Earlier this month "Carol" won best picture in the New York Film Critics Circle's awards vote. The NY group also honored it for directing, screenplay (Phyllis Nagy) and cinematography (Edward Lachman). 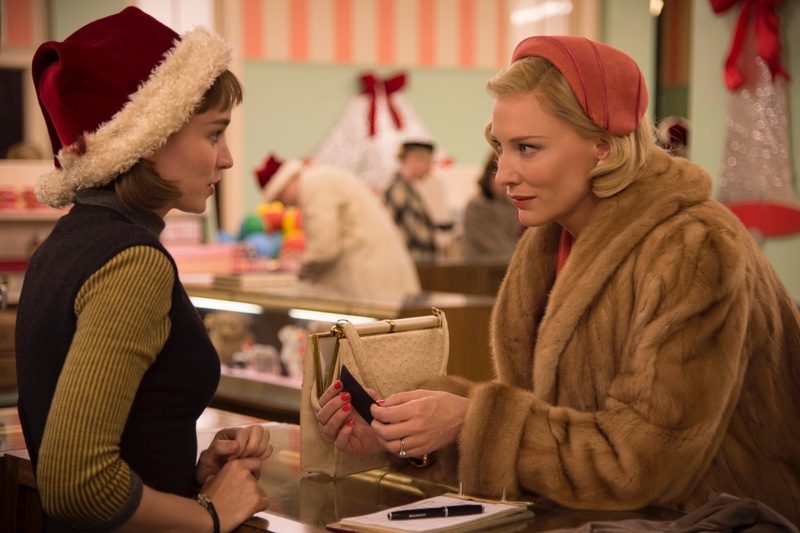 "Carol" did $336,924 last weekend at 16 theatres and has a four week cume of $1.2 million. It expands its run Dec. 25. (2) Warner Bros. and Village Roadshow's R rated 3D action adventure thriller "Mad Max: Fury Road" is directed by George Miller (the first two "Mad Max" episodes and "Mad Max Beyond Thunderdome"), who also received a Globes nod for directing. "Fury" was named best picture earlier this month by the National Board of Review, an important win that almost certainly will make other awards groups give it consideration they don't typically give to action adventures. The film's Globes nods will likely translate into serious consideration by Oscar voters. "Fury" opened last May 15 to $45.4 million and went on to gross $153.6 million domestically. (3) The R rated drama "The Revenant," from 20th Century Fox, New Regency Pictures and RatPac Entertainment, opens in limited release Dec. 25 and goes wide Jan. 8, 2016. Its director, Alejandro Gonzalez Inarritu, was last year's Oscar winner for best directing, original screenplay and best picture producer for "Birdman." Other Globes nods for "Revenant" include: directing, actor-drama (Leonardo DiCaprio) and original score (Ryuichi Sakamoto). DiCapriois a five-time Oscar nominee and has two Globes wins – best actor-drama in 2005 for "The Aviator" and best actor-comedy or musical in 2014 for "The Wolf of Wall Street" -- and eight more Globes noms to his credit. (4) A24's R rated drama "Room"is directed by Lenny Abrahamson ("Frank") and stars Brie Larson and Jacob Tremblay. Besides its best picture-drama nod, "Room" received Globes noms for best actress-drama (Larson) and screenplay (Emma Donoghue). "Room" first attracted attention last September at Toronto when it won the People's Choice Award. Last week it also received SAG noms for female actor (Larson) and supporting male actor (Tremblay). In the NBR vote earlier this month Larson won best actress and Tremblay was honored for breakthrough performance. Since opening last Oct. 15, "Room" has grossed $4.2 million. It grossed $246,510 last weekend at198 theatres. (5) "Spotlight" is the only one of the five Globes best picture-drama nominees to also have received a SAG ensemble cast nod. Hollywood handicappers have regarded "Spotlight" as the closest thing to a frontrunner in this year's still wide open race. Earlier this month "Spotlight" was honored by the Los Angeles Film Critics Association as its best picture. It's also been named best picture by the New York Film Critics Online, Gotham Awards, Boston Society of Film Critics and Washington, D.C. Film Critics. And the New York Film Critics Circle voted Michael Keaton best actor. The Globes' five best picture-comedy or musical nominees are a diverse group and in some cases may or may not actually be comedies. (1) "The Big Short," a SAG ensemble cast nominee (see above), not only is a Globes best picture-comedy or musical nom, but also has Globes noms for best actor-comedy or musical (Christian Bale and Steve Carell, who will likely cancel each other out) and screenplay (Charles Randolph & Adam McKay). (2)"Joy," opening wide Dec. 25 from 20th Century Fox, Annapurna Pictures and Davis Entertainment, is a PG-13 rated drama with comedy – or, if you prefer, a comedy with drama -- directed by David O. Russell, a three-time best directing Oscar nominee for "The Fighter," "Silver Linings Playbook" and "American Hustle" and a two-time screenwriting nominee. Jennifer Lawrence, a best actress Oscar winner for "Silver Linings Playbook," playsJoy, who's launched a business dynasty. Joy's dad, Robert De Niro, is a best actor Oscar winner for "Raging Bull" and a supporting actor winner for "The Godfather: Part II. "Bradley Cooper, playing a TV executive, is a best actor Oscar nominee for "Silver Linings Playbook" and "American Sniper" and a supporting actor nominee for "American Hustle." "Joy" also received a Globes nod for best actress-comedy or musical (Lawrence). It did not receive any SAG noms, which came as a major surprise to Hollywood handicappers, who had expected it to do very well with the guild. 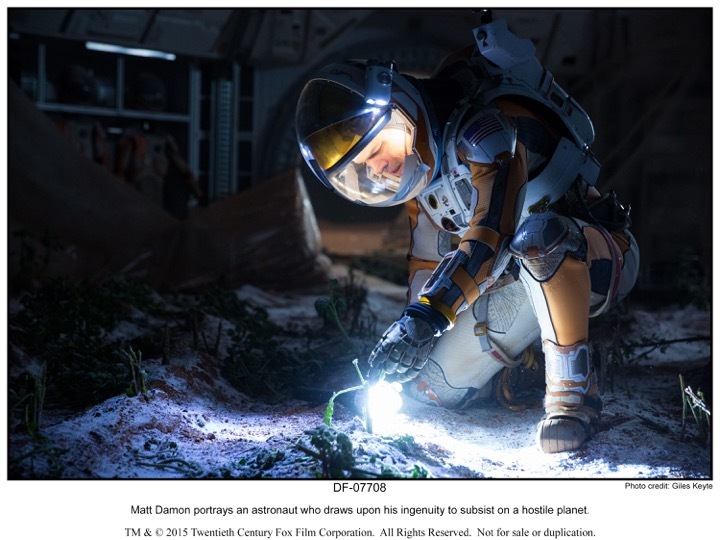 (3) 20th Century Fox and Scott Free Productions' PG-13 rated 3D sci-fi action adventure "The Martian" is directed by "Gladiator" director and three time Oscar nominee Ridley Scott. Starring are: Matt Damon, Jessica Chastain and Kristen Wiig. "Martian" opened last Oct. 2 to $54.3 million and has done $222.8 million domestically through last weekend. The big challenge for "Martian" is getting Academy members to seriously consider a sci-fi film for best picture. While it works to "Martian's" advantage to be competing in the Globes' less competitive comedy or musical category, that comedy classification could hurt it with Oscar voters, who tend to look down on comedies when they vote for best picture. Earlier this month, "Martian" won best director in the NBR vote, which should help focus directing attention on Scott with Academy voters and also with members of the Directors Guild of America (DGA) and the Academy's Directors' Branch. Damon is a two-time Oscar nominee for acting, but his only Oscar win was for original screenplay for "Good Will Hunting" in 1998 (shared with Ben Affleck). Between his Globes nom for best actor-comedy or musical and his NBR best actor win, he's on track to get into Oscar's best actor race. (4) 20th Century Fox and Chernin Entertainment's R rated action comedy "Spy" is from "Bridesmaids" and "The Heat" director Paul Feig and stars Melissa McCarthy, Jason Statham, Rose Byrne and Jude Law. Unlike some of its competing nominees in this category, there's no question that "Spy" is a comedy. It also received a Globes nom for McCarthy in the best actress-comedy or musical category. "Spy" opened last June 5 to $29.1 million and wound up doing $110.8 million domestically. (5) Universal Pictures' R rated comedy "Trainwreck" is from Judd Apatow, producer of "Bridesmaids" and director of "Knocked Up." Starring are Amy Schumer, Bill Hader and Brie Larson. Schumer is also a Globes nominee for best actress-comedy or musical. Larson isn't a Globes nominee for "Trainwreck," but she did get a Globes nod for best actress-drama for her performance in "Room." "Trainwreck," which is also most definitely a comedy, opened last July 17 to $30.1 million. It ended up grossing $110.2 million domestically. Bottom line:Hollywood handicappers will be reading the awards tea leaves again when the Broadcast Film Critics Association unveils its noms Dec. 14. The BFCA is known as a generally good indicator of how Academy members may vote and its noms will make headlines and be trumpeted in movie ads for weeks to come.